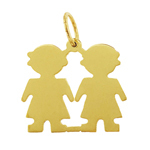 One Boy, One Girl makes this 14Kt Gold Engraveable Twin Boy / Girl Plate one spectacular gold charm. 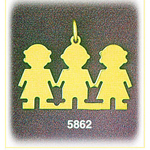 Slip this 14Kt Gold Engraveable Twin Boy / Girl Plate Charm onto your favorite gold charm bracelet to pay tribute to your son and daughter. 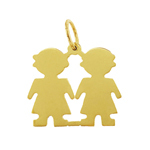 Tailored to perfection this gold childhood charm features the silhouette of a young girl and a young boy side by side giving you two radiant gold charms for the price of one. 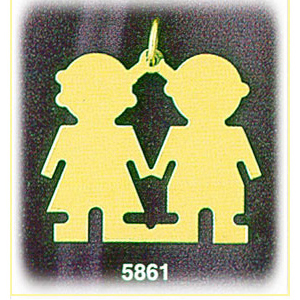 Pendant is crafted in 14k yellow gold featuring a polished finish with flat back, it measures approximately (28mm - 1 1/8") in width by (24mm - 1") in height and weighs 3.4 grams, it is recommended for necklaces.